In Russia, taking part in a demonstration that hasn’t been sanctioned by the government can cost citizens their right to work in federal agencies. Officially dubbed “unreliable” citizens, opposition activists and other political protesters are entered into special blacklists drawn up by law enforcement agencies for purposes that are not entirely understood. It was on such a blacklist that Vera Sizova, a retired resident of St. Petersburg, unexpectedly found herself – upon being told that she was banned from working for the 2010 Russian Census because of her son’s opposition activities. Despite repeated promises from the Russian government to ensure a good life for its veterans, Karavanets is not alone in his sentiments. Feeling abandoned, some have returned their medals as they literally struggle to survive in abysmal conditions. As United Civil Front leader Garry Kasparov argues, Russia’s ruling regime has offended its veterans in the worst possible way: by essentially carrying out the work of the Third Reich. 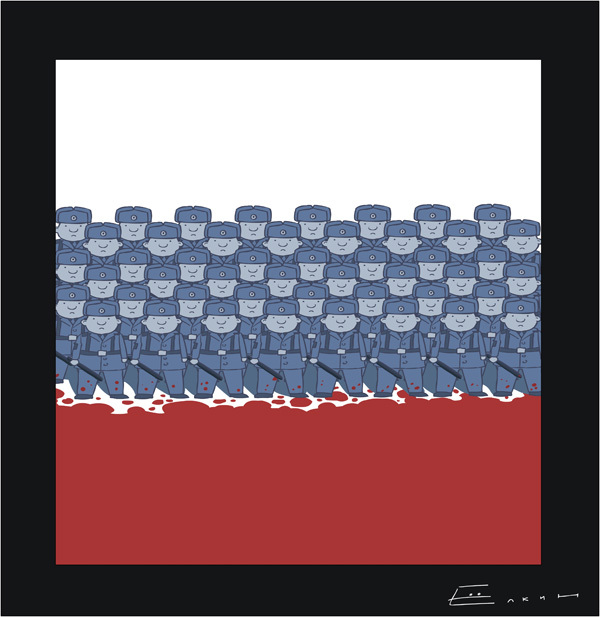 In Brezhnev’s time, Victory Day began to be actively used to strengthen the ideological basis of the Soviet system. Victory in the Great Patriotic War became not just a symbol to bring society together, but a central element of Soviet propaganda, justifying growing socio-economic problems and all the crimes of the Stalin era. Naturally, the real history of the Great War was sacrificed for a semi-official myth that worked to their advantage. 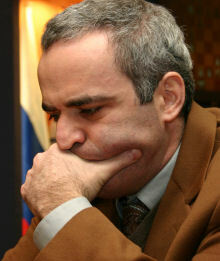 Garry Kasparov grew up knowing that coming second was not good enough. This will to win was one of the crucial factors behind the 22-year-old Soviet chess player becoming the youngest-ever World Chess Champion in 1985. He retained his title for 15 years. The ambitious, outspoken youth was seen by the West as the new face of Russian chess — and, more importantly, of the country that was ready for the first time in 70 years to say good-bye to communism and start moving towards democracy. The Cold War, both on and off the chessboard, was over. Kasparov and his fellow players no longer had to be part of it and could concentrate on the game in which they excelled. Or so it seemed in the heady days when Gorbachev’s reforms awoke a sense of elation in many. That was not to last long. Immediately after retiring from professional chess, Kasparov returned to action — this time on a political battleground. He formed the United Civil Front, a pro-democracy movement, and took an active part in creating The Other Russia, an anti-Putin coalition. After Kasparov’s plans to stand as a candidate for the 2008 Russian presidential race were disrupted — no one was willing to rent him a hall large enough to hold his supporters so he wasn’t allowed to be a candidate — he remained the leader of the UCF, organising an online “Putin must go” campaign. 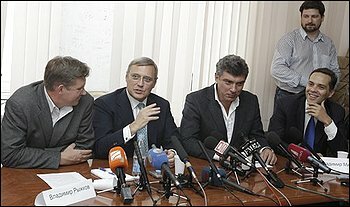 Last week in Moscow four of the most formidable opponents of the Putin dictatorship openly joined forces in Moscow: They included a former prime minister (Mikhail Kasyanov), a former first deputy prime minister (Boris Nemtsov), a former leading opposition parliamentarian (Vladimir Ryzkhkov) and a former high-ranking executive official from the Kremlin (Vladimir Milov). They call their group “Russia Without Corruption and Lawlessness.” They were clear in their motivations: “The prospect of having the great Putin till the year 2024 in our country is a disaster for Russia,” Nemtsov said. The Kremlin is worried, and well it should be. This formidable quartet has every necessary qualification to unseat the Putin regime. Sergei Mitrokhin. Leonid Gozman. Do you know those names? Mitrokhin is the obscure leader of the obscure Yabloko party established by Gigori Yavlinsky, and Gozman is the even more obscure leader of the even more obscure Right Cause party, successor to the Union of Right Forces established by Boris Nemtsov. Neither gentleman plays any significant role in the current Russian opposition movement led by Boris Nemtsov and Garry Kasparov. 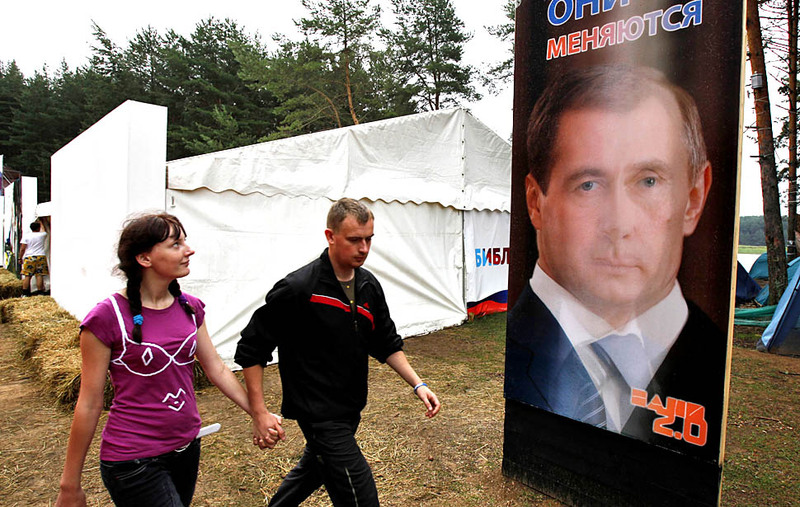 Neither party holds as much as a single seat in the Russian legislature. So naturally, both were invited to the Kremlin’s sham “modernization” conference in Yaroslavl last week (200 miles north of — that is, very far from — Moscow) so the Kremlin could prove how liberal and open and democratic it is. Neither offered any serious direct criticism of Putin or challenged his authority in any way. Neither Kasparov nor Nemtsov nor any other serious opposition figure, of course, was on the guest list. And, of course, the Americans on hand did not say a single word about their absence.